A plurality of Texas voters think the state should be spending more on public and higher education, but those numbers hide differences between conservatives and liberals, according to the latest University of Texas/Texas Tribune Poll. 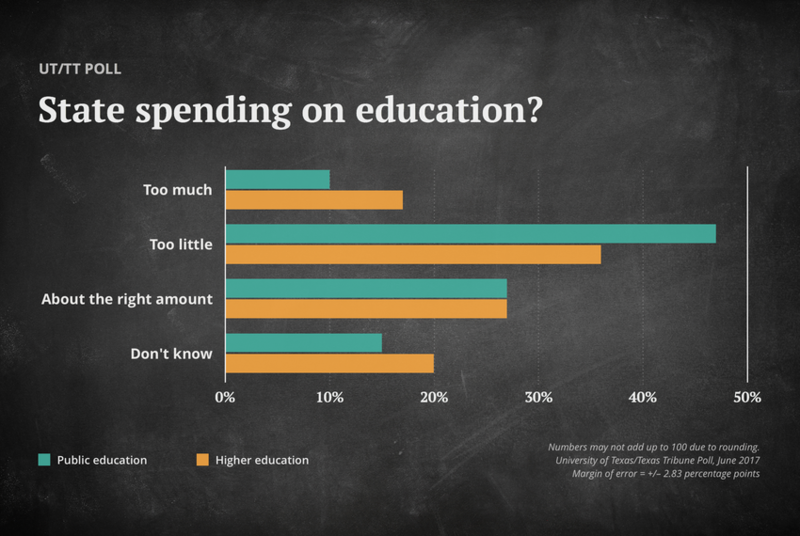 While small numbers of Texas voters believe spending on public and higher education is too high, pluralities think the state is not spending enough, according to the latest University of Texas/Texas Tribune Poll. In both cases, 27 percent of voters said the state is spending about the right amount. Almost half of Texas voters — 47 percent — would spend more on public education, while only 10 percent said the state is spending too much already, the poll found. Republican voters were the most satisfied, with 41 percent saying the state spends about the right amount on public education. There was a split in the ranks, with 47 percent of Tea Party Republicans saying spending was about right, compared with 28 percent of non-Tea Party Republicans. Most Democrats — 69 percent — said the state is spending too little on primary and secondary education. Most Texas voters would oppose reducing state funding for higher education — 54 percent oppose that, 33 percent support it — and a plurality oppose taking the power to set tuition away from the public colleges and universities and giving it to the Legislature. While 34 percent would give the job to lawmakers, 44 percent oppose that idea. Those ideas are somewhat linked, and some of the differences in opinion are partisan. Half of Republican voters would support reducing higher education funding by the state, and Republicans split 40 percent to 40 percent on letting the Legislature or the colleges set tuition rates. Three-quarters of the Democrats oppose cutting state funding for higher education, and 47 percent of them would leave tuition in the schools’ control. School vouchers — using private money to pay for private schooling — fell short in the regular legislative session, and voter opinion is divided. Almost half of Texas voters — 48 percent — oppose “redirecting state tax revenue to help parents pay for some of the cost of sending their children to private or parochial schools,” while 42 percent support doing that. Some feel strongly about it: 16 percent of them in favor, 33 percent against. As with other issues, party flags make a difference. Among Republicans, 55 percent support vouchers and 35 percent oppose them. Among Democrats, 27 percent support them and 61 percent oppose. Among voters with kids in public schools, 48 percent support vouchers and 43 percent oppose them. The governor’s push for pre-kindergarten programs has a constituency out there: 61 percent of Texas voters said they would support increased state spending on pre-K. But they’re not the governor’s voters: 82 percent of Democrats like the idea, as do 43 percent of Republicans. The more conservative they are, the less they like it: 56 percent of non-Tea Party Republicans favor higher pre-K spending, but only 31 percent of Tea Party Republicans do. Among that last group, 60 percent oppose expanding pre-K. The University of Texas/Texas Tribune internet survey of 1,200 registered voters was conducted from June 2 to June 11 and has an overall margin of error of +/- 2.83 percentage points. Numbers in charts might not add up to 100 percent because of rounding. This is one of several stories on the latest University of Texas/Texas Tribune Poll. Earlier: Texans on President Trump and the Russia inquiries, the mood of the state and grades on top elected officials, Texans’ views on immigration and local issues, and bathrooms and cultural issues. Disclosure: The University of Texas at Austin has been a financial supporter of The Texas Tribune. A complete list of Tribune donors and sponsors can be viewed here. UT/TT Poll: Texas voters weigh in on importance of "bathroom bill"